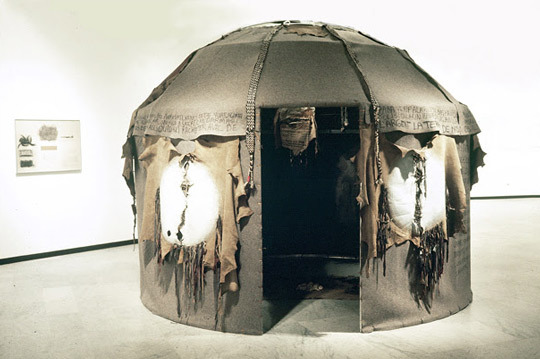 Ni̇l Yalter, “Nomad’s Tent,” 1973. Courtesy of Istanbul Bilgi University. Within the scope of its ten-year anniversary celebrations, Istanbul Modern presents Neighbours—Contemporary Narratives from Turkey and Beyond, an exhibition that explores a specific common thread that runs through art made today in a vast geography, extending from Eastern Europe to Asia and from the Caucasus to the Middle East. The exhibition focuses on an art that relates to vernacular forms like oral tradition and popular theater—forms that are at the crossroads of social interaction and expressions of individual voices in the public domain. Looking at the way social customs, like spectacles and ceremonies, have seeped into the language of the visual arts, Neighbours touches upon two defining elements of the cultural life in the region: storytelling and travel. Both these aspects have frequently been interwoven in the artistic languages of the area: they have played a role in the cultural life of the many communities that have shared a long layered history, fraught with the traditional nomadism of its peoples, their ensuing diasporas and smaller emigrations of individuals, and graced by the voices that told the stories of these movements. Neighbours pays homage to the culture that once was spread by the aşık (traveling bard), by the meddah (public storyteller) and by the popular shadow theater players. It examines how the narrative spirit, for generations a defining trait in the popular and cultural life of the region, has found its voice today in many a work by contemporary visual artists. It features works of thirty-five artists and artist collectives from the region and a program of performances, screenings, conversations and workshops related to the region’s art and culture. A thematic video art program, Come Again? is on view in a dedicated room in the exhibition hall. Moreover, Istanbul Modern borrows a festival concept created by ACCEA – the Armenian Centre for Experimental Contemporary Art in Yerevan: One Square Meter Theater Festival. By setting the same one-square-meter stage in the very middle of the exhibition hall, Istanbul Modern hosts both theater groups invited by ACCEA for the exhibition opening and a variety of events from Turkey and the region throughout the exhibition. The exhibition is sponsored by the Eczacıbaşı Group, and supported by the Republic of Turkey Promotion Fund, TAV Airports Holding, the Adam Mickiewicz Institute, the Mondriaan Fund, and the Ruya Foundation.